For simple circuits, it’s easy enough to grab a breadboard and start putting it together. Breadboards make it easy to check your circuit for mistakes before soldering together a finished product. But if you have a more complicated circuit, or if you need to do response modeling or other math on your design before you start building, you’ll need circuit simulation software. While it’s easy to get a trial version of something like OrCAD PSpice, this software doesn’t have all of the features available unless you’re willing to pony up some cash. Luckily, there’s a fully featured free and open source circuit simulation software called Qucs (Quite Universal Circuit Simulator), released under the GPL, that offers a decent alternative to other paid circuit simulators. Qucs runs its own software separate from SPICE since SPICE isn’t licensed for reuse. Qucs has most of the components that you’ll need for professional-level circuit simulation as well as many different transistor models. For more details, the Qucs Wikipedia page lists all of the features available, as does the project’s FAQ page. If you’re new to the world of circuit simulation, we went over the basics of using SPICE in a recent Hack Chat. Thanks to [Clovis] for the tip! But this is all digital. What do you do if you’re working on an analog system? Lucky for you, there’s a system built for analog and mixed-signal analysis, and it’s been around for decades. This week we’re talking all about PSpice, a simulator for analog analysis that will give you voltages and currents across every node in a schematic. 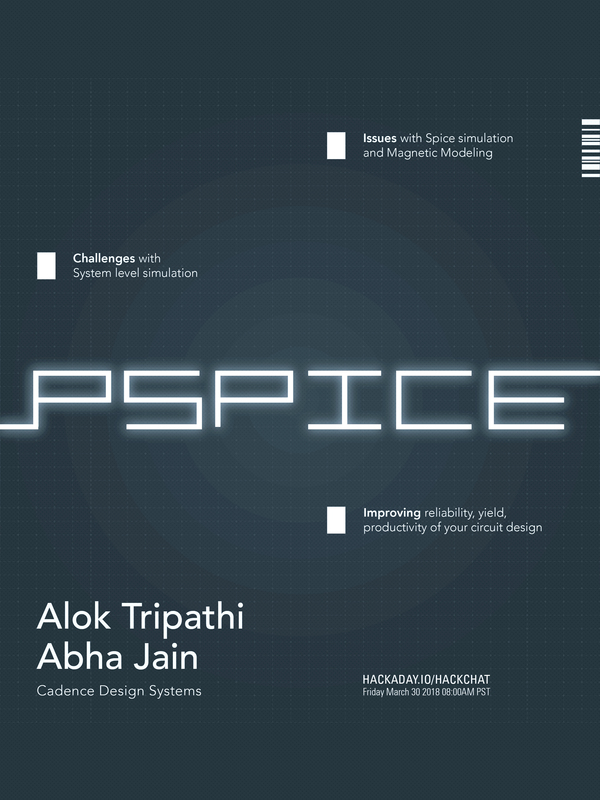 For this week’s Hack Chat, we’re going to be talking about PSpice with [Abha Jain] and [Alok Tripathi]. [Abha] has worked at Cadence for 19 years and has been part of the PSpice R&D team for the last decade. She’s an MTech in VLSI Design Tools and Technology and holds multiple EDA patents. [Alok] graduated in 1993 with a B. Tech in Electrical Engineering. He started working at the Department of Atomic Energy in 1993 as a power supply and control system designer for particle accelerators. Currently, he’s working with Cadence and is the Product Engineering Architect for PSpice and OrCAD. For this Hack Chat, we’re going to be discussing the challenges of system-level simulation, improving reliability, yield, and productivity of circuit design, the issues of Spice simulation, and answer the question, ‘on an infinite grid of one Ohm resistors, what is the resistance between two nodes a knight’s move apart?’ You are, of course, encouraged to add your own questions to the Hack Chat. You can do that by leaving the questions as a comment on this Hack Chat’s event page. Our Hack Chats are live community events on the Hackaday.io Hack Chat group messaging. This week it’s going down at an unusual time: 8 AM Pacific, Friday, March 30th Want to know what time this is happening in your neck of the woods? Have a countdown timer!